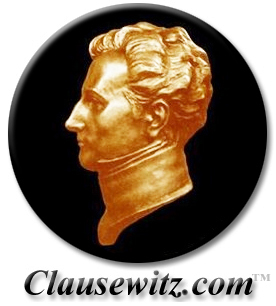 INTRODUCTION: The Prussian military thinker Carl von Clausewitz is widely acknowledged as the most important of the classical strategic thinkers. Even though he's been dead for nearly two centuries, he remains a powerful living influence: the most frequently cited, the most controversial, and in many respects the most modern of strategic theorists. This website is intended as a central source for information, articles, and arguments about the man and his ideas. It also includes a great deal of ancillary information (e.g., on Clausewitz-related tourism, graphics, humor) that may be of use to those researching, writing, or teaching about Clausewitz. It is designed to accommodate anyone interested in understanding human strategies, including not only scholarly researchers on Clausewitz but also students and faculty in professional military education (PME) institutions, business schools, and other organizations concerned with human competition and conflict. MAIN CONTENT — To access our main content categories, see the navigation bar at the top of your screen. The categories are: Bibliographies, Bookstores, FAQs, Graphics, Readings, Texts, Videos, and Search. for the Clausewitz Studies Newsletter (monthly), edited by Vanya Eftimova Bellinger. Each issue includes sign-up information. Article: "Clausewitz and His Works"
Paper: "Clausewitz's Categories of War and the Supersession of 'Absolute War'"
Paper: "Tiptoe Through the Trinity"
Article: Alan D. Beyerchen, "Clausewitz, Nonlinearity and the Unpredictability of War"